Nowoo Kwak, a doctoral candidate at the laboratory of Professor Woochul Jung (Sustainable Energy Materials Lab. ), won the grand prize on the oral presentation competition at the Conference of the Korean Ceramic Society held on 15-17 April, 2015. The title of his presentation was “Doubly doped nano-crystalline CeO2 films by PLD : Measurement of grain boundary conductivity at the elevated temperature”. Bonjae Koo, a doctoral candidate at the laboratory of Professor Woochul Jung (Sustainable Energy Materials Lab. ), won the Outstanding Poster Award in the SOFC branch at the Conference of the Korean Ceramic Society held on 15-17 April, 2015. The title of his presentation was “Controlling Surface Sr Segregation Behaviors in Model Thin Film Solid Oxide Fuel Cells Cathodes”. Yoonseok Choi, a doctoral candidate at the laboratory of Professor Woochul Jung (Sustainable Energy Materials Lab. ), won the Outstanding Poster Award at the Conference of the Korean Ceramic Society held on 15-17 April, 2015. The title of his presentation was “Electrochemically modified, robust solid oxide fuel cell anode for direct-hydrocarbon utilization”. Han Gil Seo, a mater candidate at the laboratory of Professor Woochul Jung (Sustainable Energy Materials Lab. 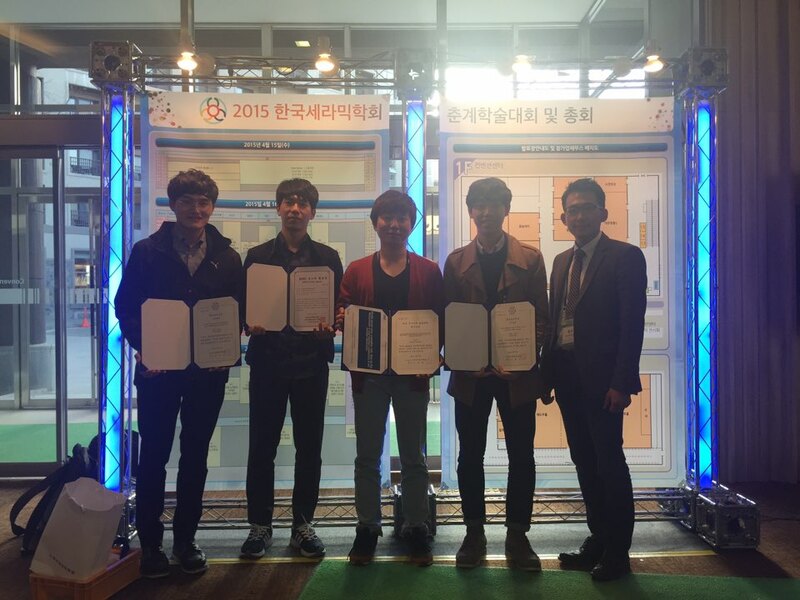 ), won the Outstanding Poster Award at the Conference of the Korean Ceramic Society held on 15-17 April, 2015. The title of his presentation was “Fabrication of Nanostructured Metal/Oxide Composite Films for Micro SOFC Cathodes”.